A little while back, I got an email from Hazel Aggrey-Orleans, a few lines about her work. I responded with a few lines of my own out of respect. Hazel’s response to my few raggedy lines got my attention because she was warm and her free spirit came through. I do not consider myself to know everything about the fashion world but I know when I meet someone who is passionate about her craft and is ready to put everything on the line it. That is exactly what I see in Hazel, the powerhouse behind Eki Orleans. As the label prepares to showcase its new collection at the London Fashion Week, Hazel talks about how the juxtaposition of the turbulent and calm nature of oceanic waves inspired her to take Eki Orleans to a whole new level. Belinda: How long have you been working in the fashion industry? Eki Orleans: The fashion label started 3 years ago. Belinda: Was fashion your first passion or did you progress from one form of the art until you found your place in fashion design? Eki Orleans: I started off in the corporate world of banking (marketing) and worked there for over 8 years but I always knew this was not my passion. It was during my first pregnancy that I decided to pursue my real passion. Belinda: Who and what inspires and influences you as an artist and fashion designer and why? Eki Orleans: Diane van Furstenberg (DVF) inspires me as she has been able to turn her beautiful dresses into a household name and she is all about beautiful and vibrant prints. DVF is one of my favourite designers. I absolutely adore her feminine style and her use of silks combined with bright prints. In terms of what inspires me as an artist, I would say that I can use my own culture and life experiences and turn it into art. Belinda: And who do you respect in the fashion world and would you like to emulate and have the same impact they have had in the fashion world? Eki Orleans: DVF ! Diane van Furstenberg all the way. She is such a household name and that is what I want Eki Orleans to be. Belinda: You are of mixed heritage, which part of your African heritage inspires you and of course, the part of your European heritage that also inspires you? Eki Orleans: The great thing about being of mixed heritage is that you get to pick the best of both worlds. I would say I am more analytical of what works and doesn’t work in both cultures. What I appreciate most about my African (Nigeria) heritage is the warmth of our people as well as the diverse colours. On the flip side, being of German heritage is all about being very structured and organized. I believe the combination of both is a great asset. Belinda: You have a collection of Western and African designs in your line, what do you admire about the African fashion industry that encourages you you to part of it? Eki Orleans: I love the use of vibrant colours which plays such a big part in African designs. My personal wardrobe is a burst of colour with not a single black item in there. Belinda: Are you a fan of the Ankara fabric and why? 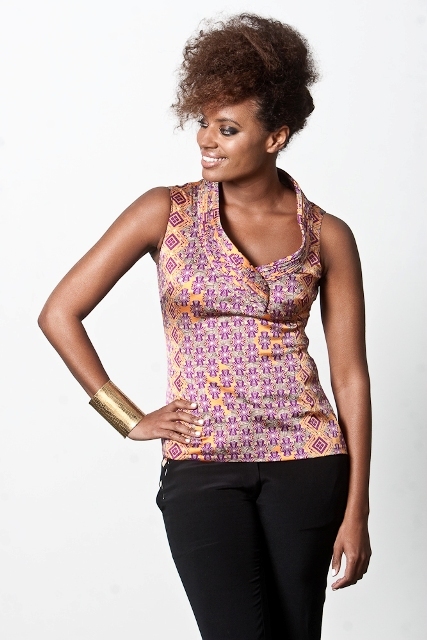 Eki Orleans: What I absolutely love about Ankara fabrics are the intricate prints and vibrant colours. Belinda: Are there any fashion designers from the African continent, who you admire? Eki Orleans: I love Ituen Basi’s use of vibrant colours, Nkwo’s free spirited style, Duro Olowu’s pure elegance and Jewel By Lisa – wow, she is taking African designs to a new level. I admire all of them and many more. I would love to work and collaborate with any of them in the future. Belinda: What does Eki Orleans as a design house stand for and wants to communicate through its fabrics and designs in today’s large landscape of fashion? Eki Orleans: Eki Orleans is all about creating a commotion and becoming the centre of attraction when you walk into a room. The fabrics – the soft delicate nature and the way in which they just glide on the body speak for themselves. I see Eki Orleans as a fresh and new outlook on African prints and designs. Belinda: You design your own fabrics, why did you go down that route? Eki Orleans: I knew starting a fashion line would be very competitive and so, it was obvious I had to come up with an innovate and fresh new idea. I personally love the movement of soft silky fabrics and combining that with West African prints is something I wanted to try out. I worked on a few samples and instantly fell in love with the whole concept. Belinda: In a nutshell describe what you want your design to communicate to those who come in contact with it? Eki Orleans: A client recently told me; “Your dress is one dress I have in my wardrobe, that when I wear, I know I am bound to get a lot of compliments. If all my customers could feel like that, I would be ecstatic! Belinda: What do you make; dresses, scarves and what else? Eki Orleans: At the moment, we just focus mainly on dresses and scarves. We have introduced a pair of silk trousers in our new collection as well as a bikini. Belinda: Your designs are currently for women only. Do you have plans to design for men and children in the future? Eki Orleans: I may branch out into men’s shirts at a later stage. Belinda: Who would you want to see in one of your fabrics or wearing one of your designs? Eki Orleans: There are no restrictions, anyone and every person who appreciates lovely prints. Belinda: Is there anyone that you would like to dress up and why? Eki Orleans: I would love to see Michelle Obama and Thandie Newton wear our dresses. I think those two ladies have so much grace and sophistication about them. Belinda: What was your biggest fear when you stepped out to start your fabric and fashion design company? Eki Orleans: Whether or not people would be receptive of our take on African prints. Belinda: You recently rebranded your company from Orleans Designs to Eki Orleans, its ethos and everything it stands for, why that bold move? Eki Orleans: The reason we rebranded is simple. Orleans Designs did not represent our brand – it was outdated and did not speak to our designs. Eki Orleans on the other hand is young, fresh, innovative and also has a story of its own – Eki means centre of attraction, so when you wear an Eki Orleans dress, you naturally become the centre of attraction. I couldn’t think of a better name to represent our brand. Belinda: Does Eki have a symbolic meaning/representation which your line of fabrics and clothing reflects? Eki Orleans: Yes, it means Centre of Attraction. Belinda: Were you concerned you may lose some of your core fan base or did you have a strong belief that it would open you up to a wider audience? Eki Orleans: Yes, I was a bit nervous to start of with but I strongly believed in the new brand identity and knew that others would fall in love with it too. Belinda: It’s been a few months since you rebranded, what has the response/reaction to the new name and direction you are taking the company been like? Eki Orleans: The response has been amazing. I have had people say, they never thought twice about the initial brand but when Eki Orleans was introduced they too felt, this tied in much stronger with the fresh style of the prints and dresses. Belinda: Which fashion shows do you want to show your work at in the next 5 years? Eki Orleans: We will be showcasing during London Fashion Week, this month. Our goal is to participate in the NY, Milan and Paris fashion shows next season. It would also be such an honour to showcase our collection on African soil and one in particular we are very keen on, is the African Fashion Show in South Africa. Belinda: What are you currently working on and when is your next runway project? Eki Orleans: We are currently working on the promotion of our latest SS11 Collection. And our next runway show is going to be at the London Fashion Week 20th and 22nd Sept.
Belinda: What should people expect to see at the London Fashion Week as far as Eki Orleans is concerned? Belinda: Where do you see yourself in the next 5 years? Eki Orleans: I see Eki Orleans being a household name for beautiful prints, as well as a greater selection of intricate prints and being sold in various boutiques worldwide. All images are courtesy of Eki Orleans. This entry was posted on Saturday, September 18th, 2010 at 3:37 pm	and is filed under Africa, Fashion, Interviews, Journalism, Nigeria, People. You can follow any responses to this entry through the RSS 2.0 feed. You can leave a response, or trackback from your own site.